New follower from Freaky Friday Follow. I could use some of your tips! I hope you will take a moment to stop by my blog and check out my kind of fashion (hair jewelry). I'm not just trying to gain followers with hopping, I'm trying to spread the word about a product I love. Here's my url http://talesfrommyjournal.blogspot.com I also have a facebook page which is www.facebook.com/DeniseMartin.LillaRose I hope you can stop by there as well. It's the fastest way to hear about specials. Hello from Jamaica. 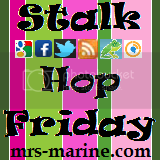 I saw your Blog on the Friday Hop. I am happy to become a Follower! I have been looking at the cool samples! Take care and my best wishes to you. I'm a new follower from the,Stalk Hop Friday. Hi! Following you from a blog hop! :0) Hope you visit me and return the follow!